In loving memory of my beautiful Mum. 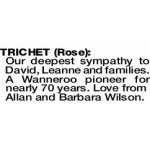 The Funeral Service to Honour the Life of Mrs Rose Trichet will be held at PINNAROO Valley Memorial Park, East Chapel, on FRIDAY (29.3.2019) commencing at 1.30pm. Following the Service the Cortege will proceed to Graveside for a Burial Service commencing at 2.45pm. 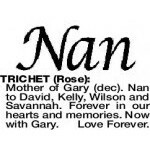 Mother of Gary (dec). 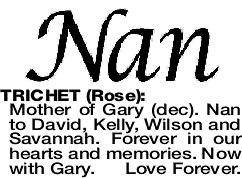 Nan to David, Kelly, Wilson and Savannah. Forever in our hearts and memories. Now with Gary. Love Forever. In loving memory of dear Rose. 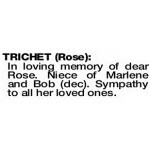 Niece of Marlene and Bob (dec). Sympathy to all her loved ones. 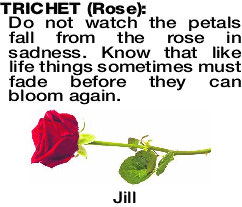 Do not watch the petals fall from the rose in sadness. 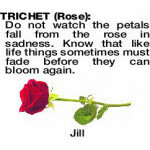 Know that like life things sometimes must fade before they can bloom again. Our deepest sympathy to David, Leanne and families.